The Shusui Koi fish was first created in 1910 by crossing an Asagi Koi fish and a Mirror Carp.The Asagi koi has a coloring which is not often seen in other varieties - light blue with dark blue scales, and red markings. The Mirror Carp has leather-like skin and lines of large scales. The result of breeding these two fish was a koi with the coloring of an Asagi but with only one line of large scales running down its back. The strange scaling, striking coloring, and symmetrical markings make the Shusui koi fish one of the strangest and most interesting variations of koi fish. Unlike most koi fish varieties the Shusui koi fish have no scales apart from the scales along their back much like the Mirror Carp it is descended from. These scales should start close to the koi's head and extend to their tail without extending to the sides of the fish or having any missing scales. The scales should be larger than the scales you see on other koi fish varieties and have a blue-black coloring which they inherited from their Asagi ancestors who have the same color of scales. Shusui koi fish's unusual coloring begs for attention as it creates contrast between blue and red. The base coloring of light blue which is often seen in Shusui koi is unusual for most koi varieties. The red markings create a stunning contrast against a background of light blue and often show up on the side of the fish or on its fins. The scales on Shusui koi fish's back also draw more attention to them as they appear to be dark blue in coloring and slightly reflective. The Shusui koi's coloring makes it a fish which is impossible to ignore. There is no established markings of Shusui koi as it is already a very distinctive variety of koi fish, but some patterns occur often in these fish. The only established rule for these koi is that the scales on their back must be large, blue-black, and regular. When it comes to other markings symmetry is a must as with all other koi fish varieties, so if your Shusui has a red marking on one side it should have another marking of around the same size on its other side to maintain a feeling of balance. 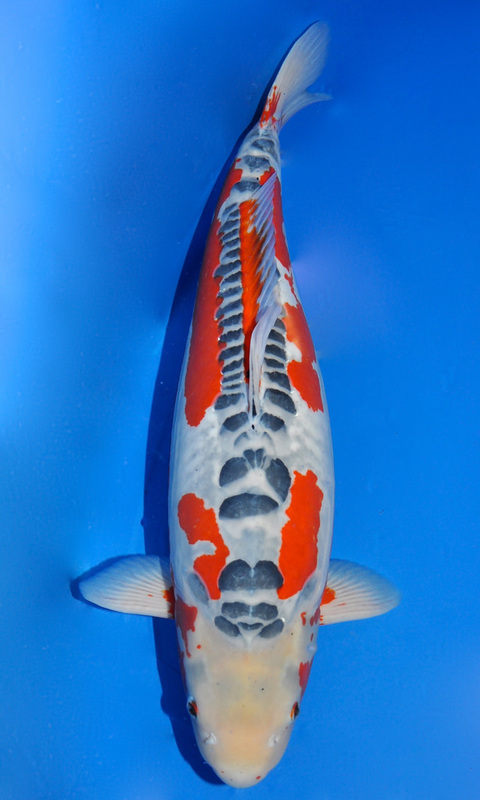 You will often see red markings along the sides of Shusui koi as well as red on their fins. The Shusui Koi fish is a very eye catching fish which will add a little more intrigue to any pond with both how it looks as well as its origins. Its leather skin and line of large scales combined with its unique coloring and markings make it hard to compare the Shusui to any other koi fish variety, so if you are looking to add an interesting and stunning koi to your pond you should definitely consider the Shusui.